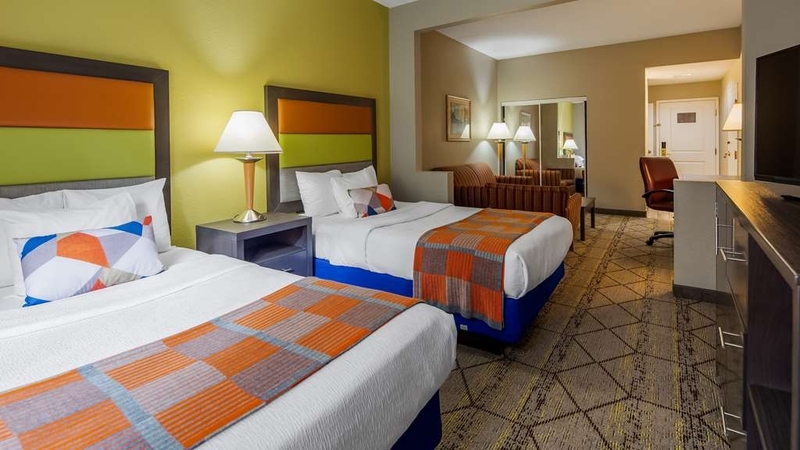 El Best Western Plus Newport News Inn & Suites se encuentra en el centro de Newport News. Venga y disfrute de las mejores atracciónes turísticas cerca de nuestro hotel. Precios bajos garantizados y ofertas exclusivas. 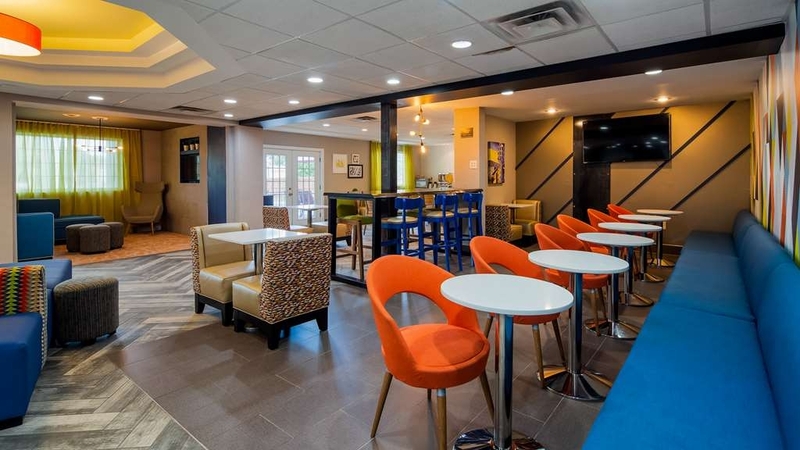 Bienvenido al Best Western Plus® Newport News Inn & Suites. Aquellos huéspedes que deseen estar situados a poca distancia del aeropuerto de Newport News (PHF) podrán disfrutar de un cómodo acceso a sus vuelos durante su estancia en este hotel de Newport News. Disfrute de una excelente ubicación a poca distancia Busch Gardens®, donde podrá encontrar vibrantes atracciones a solamente unos minutos de distancia. Con Fort Eustis y la Universidad Christopher Newport igualmente en las inmediaciones, nunca ha sido más fácil combinar negocios y placer con la mayor comodidad. Los viajeros podrán disfrutar de la mayor comodidad a la hora de asistir a los eventos celebrados en el campus y disponer del resto del día para visitar restaurantes gourmet, realizar actividades de aventura o simplemente relajarse. El centro comercial Patrick Henry es un fantástico lugar para comenzar sus vacaciones y es un auténtico paraíso para las compras. Este hotel de Newport News está situado a poca distancia de los principales restaurantes y áreas de negocios de la zona, lo que le permitirá disfrutar de la mayor comodidad durante sus desplazamientos. No obstante, al contar con una bañera de hidromasaje y piscina al aire libre de temporada, muchos de nuestros huéspedes prefieren quedarse en su habitación. Todas las habitaciones son minisuites, por lo que podrá disponer de espacio adicional para relajarse y recuperar energías. El hotel está situado a solamente 19 kilómetros de Busch Gardens y a tan solo 45 minutos en auto de Virginia Beach. Tanto si desea disfrutar de la playa como de las vibrantes atracciones locales, durante su estancia podrá encontrar todo lo que busca. Yorktown y Jamestown son dos enclaves históricos situados en las proximidades y de obligada visita para los aficionados a la historia o aquellos que prefieran disfrutar de la cultura local. El Museo Mariners es un auténtico placer para los sentidos y el complemento perfecto para cualquier itinerario. Los huéspedes en viaje de negocios con Jefferson Lab se alojan a menudo en este hotel de Newport News que ofrece tarifas especiales para empleados de esta empresa. Los trabajadores de Cannon se encuentran también entre nuestros huéspedes habituales, así como numerosos viajeros de negocios en la ciudad para asistir a reuniones y convenciones. Los usuarios del aeropuerto son siempre bienvenidos, especialmente teniendo en cuenta que el hotel está situado a menos de dos kilómetros y junto a la salida de la autopista. No obstante, nuestro hotel no es el típico establecimiento de aeropuerto. Este hotel de Newport News ofrece mucho más que simplemente una gran proximidad a las pistas. El cercano Hampton Coliseum ofrece grandes dosis de diversión durante todo el año y es una excelente opción para actividades de recreo. Disfrute de su estancia en nuestro hotel. The mindfulness of creating a great stay for the customer keeping what matters: great service, great people, cleaniness and total comfort all done with great care! I found peace at the end of a long day, and at the end of my stay, I traveled on with a smile refreshed for another long journey. "Fair to good except for the smell." I did not like the smell of the room at all. A sickening fabreeze type of smell that was overused. When I got home all my clothes and suitcase reeked of the smell. This hotel allows dogs so they probably use it to cover up pet odors. I prefer animal free hotels. This hotel was very well maintained, had a friendly staff, nice breakfast, good WiFi, and great location. I went for a business trip and it was only a ten minute drive, and even being right off the interstate it didn't have any noise pollution. We chose this Best Western because they allow dogs ($15 each surcharge). From the moment I called the motel directly to make reservations to the time we checked out, I was nothing but impressed. It was exceptionally clean and the breakfast was good and plentiful, but the thing that stood out to me was the graciousness and hospitality demonstrated by the entire staff. They were very outgoing and helpful, and they actively extended themselves to ensure I was happy every time I interacted with any of them. I've stayed in many 5 star, expensive resorts and hotels, and the experience at Best Western in Newport News compared very favorably, given what it is. I would definitely return. They have my highest possible recommendation if one is looking for economical lodging. I always stay here when I'm in town. The staff is very nice, the hotel is clean, breakfast is good. No complaints - and if I had any, the staff would be quick to take care of it. Wifi is a bit slow, but is to be expected at a hotel. The room floor had what appeared to be tiny/short dog hair on the floor next to my bed. Also it appeared that the room was not dusted and vacuumed prior to our visit. I felt uncomfortable with the bedding. I was delighted to have king mini suite for such a reasonable price. I needed extra space to spread out a project on which I was working. Everything was very clean and the bed was comfortable. My daughter was delighted to have chocolate chips and whipped cream on her waffle as well as fresh fruit. I will definitely come back here. Pillows had a smell. Shower leverage was hard to pull up. Heater made the loudest noise like it was dying. I slept cold for two days. Breakfast tasted reheated and watched a woman at the desk dig in her nose and you know the rest of what she did. The hotel had some recent exterior renovation & lobby renovations. The rooms itself were outdated and lacked toiletry items. The shower leaked and the beds weren't as comfortable or pillow top like a typical best western plus has. The eggs and sausage were not edible leaving only coffee & cereal as breakfast choices. I would not choose this hotel in Newport News again. Wonderful experience here. Hotel is clean well run with friendly staff.Cannot say enough about this location. Very close to a shopping mall with truly great restaurants.Beds were comfortable and the food was the best.Great visit to Newport News! "Didn't feel like a PLUS"
We stayed here two nights and almost always really like the Best Western experience. I did think a PLUS meant a little nicer, but guess it only means a little more space in the room. This hotel had great front-desk staff and the lobby was bright and cheerful. The room was spacious and generally felt clean but also felt very run-down - lots of nicks and scrapes on doorways, halls, etc. I am fanatic about the yuck factor of mold and rust in our rooms. This had a small amount of both - will attach pictures. But the big lack of attention from the hotel was that our TP holder was broken so they were using the back of the toilet to set the TP on. We improvised and turned the garbage can upside down. The heater unit also had some unknown yuk on the side it. We have stayed in 11 hotels in the last 3 weeks (on vacation) and this particular BW would be towards the bottom of our preferred list. My wife and I stayed here for just one night after attending a local concert. Hotel is in a very popular area but doesn't really represent the area well. Found the walls to be paper thin after being told by our next door guests to "Be Quiet". We were having a normal conversation! Rooms are partially updated but need more work. Bed was clean and comfortable. Staff was very nice and helpful. "Management is dishonest and messed up reservation day off!" 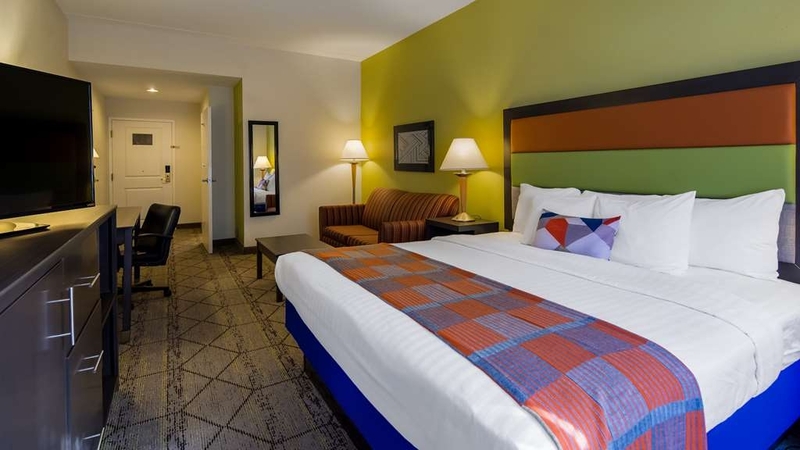 "Great hotel and very good staff"
Nice clean remodeled hotel, staff was awesome. Everything was great and i noticed breakfast had wide variety. Cleaning crew is doing great job in keeping place clean. Pool area looked good, but we never used it. All in all was a nice stay. The staff is great. Lobby area looks newly remodeled. Rooms are large and pleanty of space. Breakfast host is very attentive. Pool looked good, but we didn't use as we went to water country. Plenty of parking space. All in all great stay. We stayed here during our family reunion. They have an outdoor pool and continental breakfast. The room was very clean and the beds were super comfy. I would definitely recommend this hotel to anyone that needs a suite for a family of six. We used the pool and the kids loved it. The hotel is very close to shopping centers. 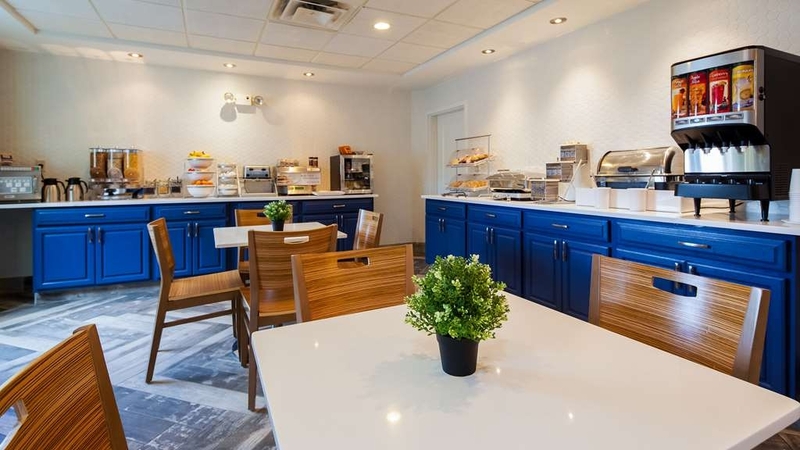 The breakfast is delicious in the dining area near the lobby. The attendant in the dining area was so sweet and helpful. Check in was easy. "Tired and in need of work"
The best thing about this hotel was Cindi, who checked us in with friendliness and enthusiasm. The room itself was grim, in the way that so many US hotels are, but made worse by the mould in the bathroom, the ancient air conditioner, which sounded like you were in the bowels of a ship, and the inability to sleep with open windows (exterior air con units congregating outside and lighting designed for interrogation rather than sleep). As always, no kettle, everthing plastic, and only coffee creamer for your tea. The breakfast is better skipped altogether. A short walk to the Fresh Market will yield a more desirable meal. We checked in yesterday for a 5-day stay at this location. There was no Closet in our room, no towels and no sheets to make up the pull out couch and the mattress was completely destroyed. They did replace the mattress for us but honestly if you have somebody who staying with you who has to use the pull-out couch I do not recommend it! also there are sesame seeds on our floor from whoever was there before. There are too many options in this area to just choose this one based on price. Definitely look around! "Best kept Secret in Hampton VA"
Okay so we drive in and my 7 year old says it's small. We said looks can be deceiving and when she got in she said wow mommy this is really nice. For the price we paid, it was a really good looking hotel. Staff was great, they were prompt in giving you information and overall the stay was very good. The service and staff were excellent. Everyone were showed great customer service. Everything was done in a timely manner. I would be glad to come back again. Next time it will be a family trip. Thank you. very pleased with the room. used my rewards points and was rewarded with a suite. quiet setting. have stayed at this bw for the last 3 years when i work a trade show in the area .breakfast was better than most. "bed very uncomfortable,,not for a goods night sleep or relaxation"
Hotel is average, room was average, construction distracted from appearance. Hallway was smelly, needs new carpet, beds were ok. Close to shopping and restaurants, convenient to interstate highway. Stayed at better places. The property was centrally located. There was a very pleasant atmosphere at the hotel. The breakfast was superior. The quality of the room exceeded my expectations. This was a great value over other hotels in the area. The hotel isn't fancy, but is undergoing renovation. I have stayed here several times and will probably stay there again. The bed was very comfortable. The hot breakfast consists of a pancake machine, scrambled eggs, & sausage. They also offer cereals and the usual pastries. "Spent portion of savings on air freshners"
From what I can gather, this site is about to undergo renovations. The desk staff was pleasant, and the facility looked clean, but every area had a new and different "odd" smell. As someone who has had sinus surgeries and used to handle the "DOA" calls for my shift, I don't have a week-developed sense of smell. And yet- every time I stepped in to the elevator it seemed to smell of stale breakfast. The lobby and hallways had a weird cleaner over funk scent. (Upon arrival at my floor, I noticed copious amounts of carpet deodorizing powder all along the edges and corners that sat overnight.) My room was comfortable, but had its own odd smell and was not particularly well lit (bathroom especially.) As another reviewer noted, the heat was on fairly high when I arrive do, accentuating the odors. Having prepaid at a great rate for a multi-day stay, I ended up sliding to a store and picking up a scented candle and two air freshners, which helped a lot. Otherwise, the room was spacious, front desk staff pleasant, and the location convenient. Housekeeping staff was a bit loud, but this shouldn't be a big deal if you are out and about during business hours. I would go back if I needed to stay locally on a budget, but would probably call first to check on renovations first. This place has potential- and will hopefully live up to it in the very near future! I was disappointed when I walked into the room and it was 82 degrees in the room, making it difficult to occupy until it cooled down. I found an old Wendy's bag with food in it from a previous occupant. The bed was very hard, and we had trouble sleeping on it. Breakfast was edible, but was not that great (we ate at Denny's the next morning, which was great!). Overall, it was a cheap room, and it felt it. next time, I'll spend a little more for a nicer hotel. We'll be back! Great location and quality for the money. Very surprised of how it looked compared to others in same price range. Can't bee location. Easily accessible to mall, dining and airport. Look forward to returning. This hotel is always my first hotel of choice. Again I had another wonderful hotel experience. The room was very well kept. The internet worked wonderfully I look forward to again staying for my business travel in the future. Thank you for completing the survey regarding your recent stay at our property. Your business is very important to us and we value your feedback. By telling us what you liked about your stay and how we can improve, you are helping us deliver a superior experience for you and other guests in the future. We hope you will come back and see us again soon. If I can be of assistance in the future, please don't hesitate to contact me at 7579521182. Thank you again for taking the time to complete the survey. We appreciate your loyalty to our brand. Rooms were nice and clean, but there was the smell of old cigarette smoke in the room. Staff was friendly and did all they could to change rooms. Hotel also seems to be under rehab and the changes do seem very nice. Breakfast was average but was hot and good. Hotel is in a good location to shopping and resaturates in the area. We had a wonderful stay. Everything was excellent. We highly recommend this hotel to anyone wanting to stay in the Hampton Roads area. It was clean and had great amenities. Service from check in to check out was a wonderful experience. We stayed there because the rooms in Bush Gardens where all sold out. We are very happy that we did and will do it again next time. We will definitely come back on our next trip to Bush Gardens. Thank you for completing the survey regarding your recent stay at our property. On behalf of our entire team, I would like to apologize for not exceeding your expectations. Your satisfaction is important to us and we will be using the feedback you gave us to implement improvements to ensure we offer a better experience for guests in the future. I hope that you will consider staying with us again so that we can have another chance to provide you with a superior experience. If I can provide any assistance, please don't hesitate to contact me directly at 7579521182. "Clean and comfortable room, updated, free internet, and friendly atmosphere." We traveled with our dogs, so it was nice to stay in this hotel. Plus, it is close to stores and good restaurants. Hotel is still in updating proces, but that really didn't interrupt our stay. We will most likely stay here again. This hotel is very nice. It's clean, and the staff are very courteous and professional. The breakfast is good and well-stocked. The location is also good; it's near some restaurants, even within walking distance. It's close to Yorktown, Williamsburg, Busch Gardens, Jamestown, Plum Tree, etc.. I stayed 4 days on a business trip and the in room internet was wonderful, very fast. Price was great, I block away other hotels quoted $40 more per night. It was only blocks to every type of restaurant and store you could ever need. Great location. Stayed here it was a GREAT TIME and had a WONDERFUL day and night. I will tell other about this place. The accommodation were GREAT. I will tell other about my stay and I would give accommodation to others also the Free Breakfast in the morning. COFFEE juices eggs sausage cereal Danishest. IT WAS ALL A GREAT TRIP AND GREAT STAY. It was a very nice hotel, employees were very nice,will stay again,hot tub and pool awesome. Everything was nice and clean, the outside entrance makes you feel welcomed enjoyed our stay at this Best Western. Nice, clean, comfy pet-friendly hotel. Good food for breakfast, comfy bed. 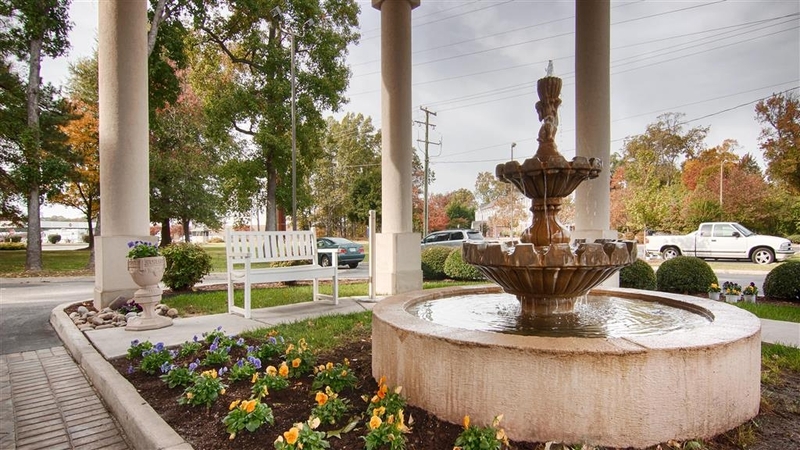 Great location to Christopher Newport University, the mall, and other local attractions. Nice looking pool & hot tub. Will definitely stay again. Staff was nice, shower was good and nice towels, but every thing was just a little shabby. The curtains were torn in the room, furniture had some chips in it, lamp shades had water stains, and the window was damaged and leaked when it rained. Room was clean, but seemed that the overall quality did not match the cost. Breakfast was fine, could use some variety - same hot items both days of stay. Breakfast area was full and busy, but tables could have used some attention - cleaning. Not really bad, but with a little extra work - would be very nice. "OK hotel for the price"
We purchased a voucher on Groupon for 3 nights at this hotel. We arrived early and I went in to make sure our reservation was there, like I said, purchased and reserved on Groupon. She could not find our reservation... not sure whose fault this was. But it took her about half an hour to find our reservation. She was very friendly and apologetic, no complaints on the front desk. She did put us in a room, early but once we walked in found out it was 1 room, not the double. About to walk back up and someone knocked on the door and she realized she put us in the wrong room. We are put in another room (#2) which was just as described, 2 beds w/sofa. Later that evening, my son pulls out the sofabed and there is water dripping off the bottom of the mattress. Pretty grossed out about this so I call the front desk to ask if there is anyway we can get a new mattress. New front desk lady, very nice and apologetic, tells me there is no one there to do this but they will gladly switch us to another room. So, we are moved to another room (#3)-just as before, Nice a big, exactly as described. So, the room backs up to the back of the Best Buy store. The mattress on the sofa bed is awful- kids slept on the cushions of the sofa bed. Chair that was included, the screw fell out of so always leaned. We did end up leaving a day early, just because there was not much to do (touristy) around here. There was the mall, shops and plenty of restaurants. The front desk was always friendly the 2 days we were there, just not a great experience with the rooms. Great location for Busch Gardens and the beach. A little dated, but rooms were spacious. The staff were accommodating. For a small hotel, they served fresh, hot, delicious breakfast. Overall cleaniness of the hotel was great. Plan on booking in the near future. We stay at the hotel five days. Our room was like shown in the photos. Comfortable, clean, A/C functioned perfectly. The bathroom was a little small but the shower was fantastic. The pool was clean and the deck chairs were very comfortable. very good breakfast. Complete: fruit, cereal, milk and yogurt, pancakes, eggs, sausages and more... Everything was great but the better was the personnel.Everybody was nice. The front desk people, Cyndi, Jennifer and a man who I don't remember his name were friendly and Zurica, the lady who helps us at breakfast was very kind and was always watchful to our needs. Thank you very much for this nice stay. We had some hair in the bathtub and the room was charged to us twice, other than that, it was a good stay. Breakfast was good, I was hoping for more of a variety for the two different days. Everything was clean, except the bathtub. We brought one of my dogs with me and they usually put people with pets on the first floor, but they made an exception for us since my dog was so small. There was some trash around the back of the hotel. I prefer upscale boutique hotels, but had to do our trip to Busch Gardens on a budget. There are 3 things I must have when booking a hotel: 1. A pool 2. Breakfast included 3. A rating of 8 out of 10 or higher (I usually use booking.com) I found a deal on Groupon for this hotel and a 7.9 rating was good enough that I immediately canceled the booking I had at a cheaper, but more sordid hotel. I had never purchased a hotel stay through Groupon before and after I purchased it, I thought maybe there was a barcode/voucher page as there was in previous purchases I had made through Groupon, but couldn't find one. This led to a phone call to Groupon which was a somewhat complicated process as I had to go through online chat first, but after speaking with them they said it was going to take 2 to 3 hours to process. After that a page showed up for me to print out. I also called the hotel a couple of days before our arrival to verify that everything was all set. So glad I found the deal on this place. The breakfast lady was absolutely wonderful. I didn't catch her name, wish I had. She sounded German, but I'm not sure. Breakfast options were pancakes (just push the button for 2 pancakes to come out), sausage, eggs that I didn't think were anything great, but hey, they were free, 3 different cereals-I think it was corn flakes, a fruit loops like kind, and a raisin bran kind, various pastries, orange juice, cranberry juice, lemonade, milk, and one other drink-another juice maybe? There was a little refrigerator next to the pancake machine that had yogurt in it and a bunch of yummy breakfast sandwich options that looked like they needed to be microwaved (there's one of those also), there's oatmeal packets, and some kind of almond, cranberries, and cheese mini packages. If you need another flavor of oatmeal, just ask the lady, she might have it. The area is small and typically crowded, but we never made it downstairs before 8 or 8:30am, so I don't know if it would be less crowded before then. The silverware is on the wall next to the mini fridge-just push the lever down, but chances are the breakfast lady will be there and do it for you. We had a King bed with a sofa bed and fridge/microwave. I really have no complaints. We didn't get to use the pool because we were too busy unfortunately and the hotel has been painted gray with blue lights at night (the internet photos still have it as a cream color) Within close range are Wendy's, Subway, Applebee's, Waffle House, Outback Steak House, Chipotle, and Exxon gas station. About a half mile to a mile away are 5 Guys, Firehouse Subs, Panera and a Wal-Mart. Within about 2 miles are a Starbucks, Dunkin' Donuts, Sonic, Red Lobster, Chili's, McDonald's, Papa John's, and Texas Longhorn Steak House. It was about a 25 minute drive to the parks from here and fyi, traffic pretty much sucked wherever we went in Virginia. Between tourists and construction I can't say that driving was pleasant, but,again, no complaints about the hotel and housekeeping was wonderful!! The hotel was clean and modern looking, The rooms were large and comfortable. Would definitely stay here again! The gentleman who checked me in was friendly and welcoming! I stay at a lot of Best Westerns, and this is among my top favorite locations! "Nice Place while visiting Colleges"
This was very nice hotel, reasonably priced with a great breakfast. The room is large with a fridge and a freezer. 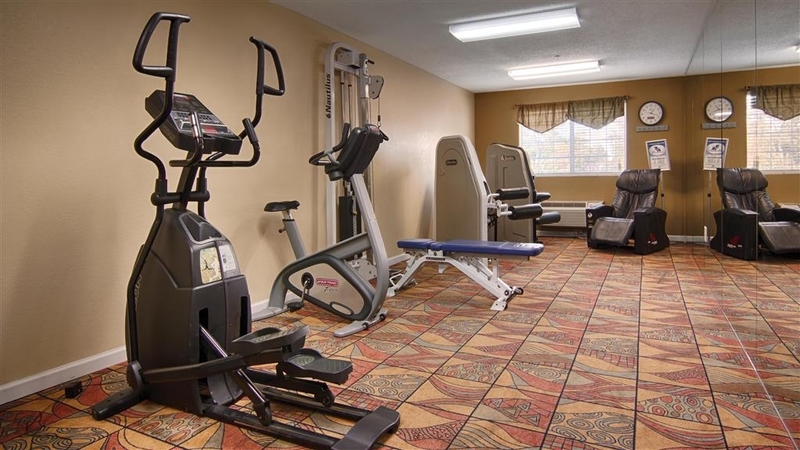 There is also a fitness center which we did not use this time but will when we come again. This place was not worth close to $400 dollars I paid to stay 3 nights at. The place smelled bad and was just dirty looking inside and out. Staff was friendly but place needs a makeover I would not care to stay in this hotel again, nor would I recommend a friend or family member to this hotel. Normally I stay at a Marriott property but I decided to step out away from norm and take a chance with another hotel property. I am so glad I did. From the minute I checked in to the minute I checked out, I cannot say anything bad about it. The attendant in the breakfast area was awesome, she saw me looking at the different donuts they had, and ask me what was my favorite "éclair" of course, the next thing I knew she was coming from the kitchen with a éclair on a plate. AWESOME.. The trip was suppose to be a Busch Gardens getaway for my grandkids, unfortunately it was raining to much and we ending up staying in the hotel. The grandkids ending up going into the hot tub and pool (they said it's just rain) than they found the gym. I am so glad they found something to keep them busy. The next morning was beautiful so, Busch Gardens here we come. The breakfast was nice, they had a machine that made pancakes, have never seen that before and they had a little refrigerator that had sandwiches in it, awesome idea, took a couple with us so the grandkids could have lunch. I would most definitely refer this hotel to my friends and my family and you will most definitely see me next year. Thanks for memorable weekend. The service was great. Everyone was extremely nice. This hotel is in a good location. This hotel needs an update. Our room was clean but it had a "smoked in" smell. I asked for an extra blanket. It had burn holes in it. I've stayed at many Best Western's and the quality just wasn't there. This hotel was clean and was in a good location. It was a close drive to several area attractions and not difficult to reach. There are also many chain restaurants and stores close by. The room we had was HUGE. We had plenty of space, and the mini fridge was a good addition. Breakfast was decent, the only thing we didn't like were the eggs (We think they used powdered egg mix). The staff was helpful and nice. We enjoyed our stay, and would go back if in the area. 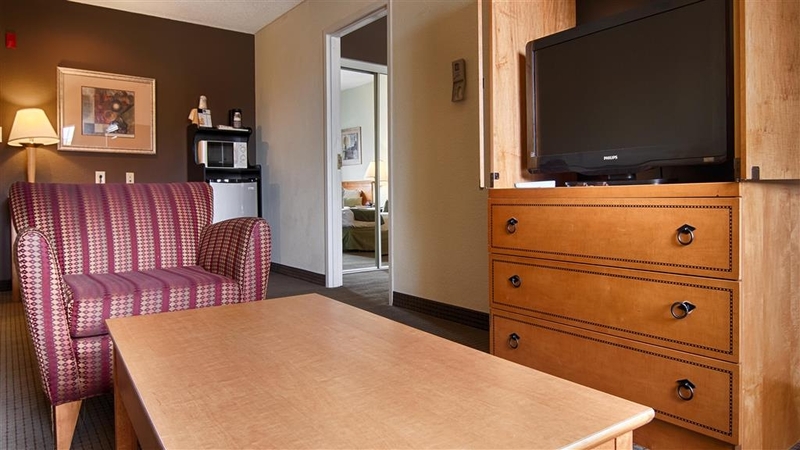 The best place to stay...many attractions at a short driving distance, it is clean, the staff is very nice, my kids enjoyed the pool, many restaurant and shopping options in walkable distance. My family had overall very good time. We stayed at Best Western Plus for one night and found this place to be an excellent value. The rooms were clean, bed comfortable and quiet. The breakfast was good and they had a wonderful pool that we spent time in while we were there. What more could you ask for? Enjoyed our stay. We will be definitely staying there again! The room was clean, the bed was comfortable and the breakfast was a nice spread. Renee was amazing at check in! I recommend staying at this hotel! Not my first time here, but my last. Exterior unkempt. Pool area neglected and unsanitary. Hot tub is a joke... just a separate area, lukewarm, no jets... uncomfortable bed. Funny smell in the elevator and rooms. Refrigerator did not work. Small restroom. The only issue I had was being charged for snack items that were paid for on a separate card and should not have been charged to the room but were. This issue is still pending as I write this since it's still early morning. hopefully the charges will be put back on my card. This was a nice enough place to stay when we visited Busch Gardens Williamsburgh. It was about 20/25 minutes from the park and there is a LOT of food and shopping in the immediate vicinity of the hotel (even within walking distance). The staff was extremely nice and very friendly. The room itself (we had a suite on the 3rd floor) had a very odd odor but it seemed to dissipate after a few days. The air conditioning was extremely noisy and didn't really help sleeping conditions at night. Other than that, the room was well appointed (smallish bathroom for 6 people though) and there was a frig and microwave in the room which was nice. The breakfast that was included each morning consisted of juices, tea and coffee, eggs, sausage, pastries, donuts, pancakes, cereal, oatmeal, breads and all the accompanying condiments. It was okay but needed to be refilled more frequently than it was. Still, the staff was attentive and on-hand at all times and did a good job of keeping up with everything. Close to CNU, clean , nice size room, good value. It is a standard budget hotel with all your basic needs met. The fitness room needs a bit of an update, but I appreciated that there was one available anyway. Decent pool in the back of the hotel. Egg product offered for breakfast is probably the worst I have seen but otherwise your basic continental options- fattening and sugary pastries, but there is cereal, bagels, toast and whole fruit too. Nice touch with the water at the entrance. "Rooms need new beds and pillows"
The hotel was clean but uncomfortable. The beds are hard and the pillows are cheap[. I had a pain in my backside and my neck, which led to discomfort on the way home. The furniture needs to be updated. Staff okay; no offer or mention of gift reward for Platinum members. At check out, staff not available. Missed separate toiletries. Being a senior citizen, found it difficult to press buttons multiple times on combo shampoo/conditioner/body wash dispenser in stall. Especially liked plenty of lighting in room.Breakfast fine but found hovering of hostess unsettling, but it may because she was being helpful to obtain tips. I stayed at this particular Best Western and found it to be very accommodating and convenient for its location. Travel around the area was easily accessible from the hotel and there were several places around to pick up items that were left at home. We always stay at this property when we are in the area. Staff has always been professional and friendly. We will continue to stay there until something changes or the property falls due to poor maintenance. Very nice hotel to bad we had a smoker smoke in the bathroom in a non smoking hotel. Wish they would have noticed this prior to our arrival the did take care of the issue quickly and when we returned to our room all the smoke smell was gone. I love staying in Best Western Plus hotels just for the beds a lone very comfy. I will continue to stay at Best Western Plus hotels. Nice hotel. Clean with great breakfast. Convenient location near many restaurants and shopping. Air conditioner could have been cooler, unable to attain below 75 degrees. Overall enjoy Best Western Hotels, will use again when in this area. Nice, clean place. Staff very friendly. We did not have the opportunity to try the breakfast. Site is a little short on parking. Some guests got a little loud on Saturday night, not the hotels fault. Would stay here again. "I've been staying at this location twice a year for the last six years. Great staff and hotel. Awesome experience!!" The hospitality of the staff from top to bottom is outstanding!! I would recommend this hotel 100% of the time. From start to finish my experience at this location was a 10 out of a 10!! Great location!! The hotel was clean for the most part, but the furniture needed repair/updating, the parking lot had cigarette butts accumulated in the corners (needed blown/cleaned) and the lawn was not mowed. I had a dog, so finding a hotel to accept him was important for me. The dog waste bags were plenty, but the lawn was over grown. Guest service was not available. Rooms have equipment that does NOT work. Our a/c unit didn't work, was not offered any other room. Shower has plastic dispensers for soap and shampoo, etc.. We sort of wondered when the last time it was cleaned and sanitized. They need to really do some work on the rooms,. "I won't stay at BW again"
Let me first say, the staff was very friendly and very pet friendly too. Too bad that didn't make up for the less than mediocre rooms I had at this hotel. The first room was so cold, I could almost see my breath. The second room (made both reservations at the same time) AC unit just circulated air, but didn't cool it much. If you stay here, BRING YOUR OWN HAIR DRYER (first room hair dryer almost caught fire and started smoking and 2nd room didn't have one), soap, shampoo, and conditioner. 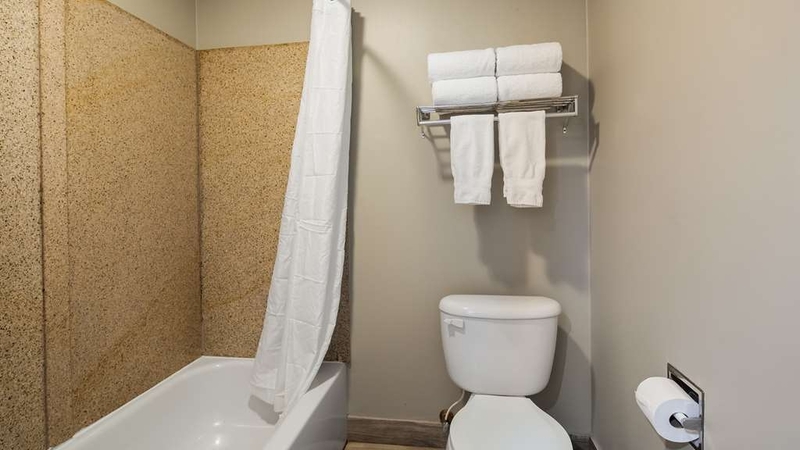 The bathrooms are very tiny, there was an "old" smell in the first room, and the toilet didn't work properly in the 2nd room. "Other guests are too noisy"
The room & facilities were mostly okay. The room was not perfectly clean - there was a little mould in the bathroom. The walls were too thin - I could hear the neighbours talking - and the doors slamming up and down the hallway from the early hours on were too disturbing. "No plus in this Best Western "
Would not recommend it to anyone. Terrible!! Need to burn and build a new one! Employees were very nice. No coffee at breakfast, had to go across parking lot to get coffee. Didn't take pictures but bathroom was pitiful. Need to renovate the rooms here. The staff was nice. But I had to ask for late check in. The bed in the ro I mean was not comfortable. The bath tub need to be cleaned. When I told the morning manager all he did was give a 25 percent discount. The tub looked black in the corners.!!!! "ok, but worse than other BW Plus"
A typical mid-level hotel conveniently located on half way between Colonial Williamsburg and Norfolk, VA. The breakfast was slightly below expectations for a Best Western Plus hotel. The carpet in our room was not vacuumed thoroughly. But other than that - a good hotel. The staff is friendly and willing to help, the amenities work fine. Check-in/check-out staff was very helpful. Was given a suite instead of a std room. All utilities worked fine and room was very clean and attractive and on the first floor as requested. Breakfast was addequate. While I am still baffled how BW awards "plus" designations, this facility provides very standard amenities very well. The entire hotel was clean, well maintained and well managed. The desk clerk was more than helpful in correcting the screw-up BW reservation line made. The lady who ran breakfast was very attentive. All in all, a good stay. I do suggest that you make reservation via any other site rather than using BW's reservation number. What a screw up! Our family stayed here for two nights, all were happy, rooms were clean and spacious,, central location, Every body had a good time, I would recommend this place without hesitaton. Close to Williamsburg airport. "Terrible Customer Service!! So We Booked Elsewhere"
This is an open letter to the rudest front desk agent I've ever been greeted by upon calling a hotel: Dear Cindy, I am sorry that I appeared to have woken you out of your sleep. It was 4am Wed. 03/01, and I thought you'd be working and eager to help. It took a long time for you to answer, and I had to keep hanging up and calling back, but I almost wish that you didn't. You see, I needed 20 rooms for a family wedding in June, as I am tasked with making the lodging arrangements. I've never stayed there before, so naturally as a prospective "guest" I'm to ask the "guest services agent" (that would be, but shouldn't be you), any questions I may have. You greeted me like I was interrupting/bothering you, and you had other things better to do than answer my questions. When I asked you about the jacuzzi, which I didn't know was outdoors (uncommon) you rudely stated "Uhh well it's Winter" as if I'm unaware what season it is. I didn't even feel comfortable asking you any other questions, but still thanked you and bid you a good evening. Your reply: "Yup". You didn't thank me for calling or return the bid of a good evening. You didn't even say that I was welcome. I am writing this review of my interaction with you for two reasons. One, to make you aware that you are solely responsible for not getting our service. We needed 20 rooms for two nights each. That's a third of the hotel that would've been occupied for 2 days. Plus lots of pet fees and deposits. You do the math. And two, to remind you that you are the first impression of the hotel. If you don't want to help, get another job where that's not required of you. Great location to CNU, Oyster Point and other main areas. Had a block of rooms for a family event. For the most part things were good. Could benefit from some updating in t he rooms. Carpeting is dated. Rooms are very spacious. "Great place to stay. Excellent value"
I got a king mini suite through groupon for $120 for 2 nights. This was a great place to stay and I got the room for a steal! The location was a 20 minute drive from Busch Gardens and 20-30 mins from colonial williamsburg. There is a lot of traffic in this area which was a little annoying for my boyfriend and I since we come from a small town in PA where the most traffic we see is a few cars at a stop light. The hotel was nice and updated. The woman at the front desk during the day was so friendly and amazing! Breakfast was busy with little seating but there was a woman restocking food and cleaning tables and was extremely helpful and nice. The room was great. Lots of pillows, a mini fridge, and microwave. There was a couch and a big padded chair in the seating area and a huge closet with mirror doors. The bathroom was great. The shower had good pressure and hot water and there were dispensers on the wall with soap, shampoo, and conditioner. I love the idea of that because it saves using all those little plastic bottles! Lots of stores and places to eat nearby. Lots of parking as well. I have no complaints. I didn't want to leave. It was a great weekend away for us! Checked in late in the evening and check-in was flawless. As a platinum guest I was not offered any bonus points or even a complimentary bottle of water. Stayed at this location due to price. Overall, it was a place for my daughters and I to rest our bodies after a long day at Busch Gardens. This property is well-maintained and with a quality staff and decent breakfast with good variety. 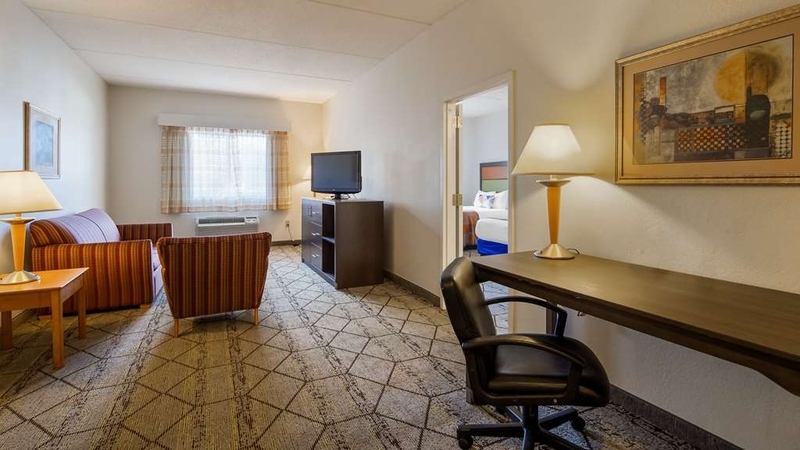 The suite layout is by far larger and more comfortable than the standard motel room layout we normally see. The AARP rate makes this an excellent value. I was in town for a conference, I have stayed at this hotel on numerous occasions. Always been a great experience! I love the location of the hotel. Close to interstate as well as places to eat and shops. I got a nice suite being a Best Western rewards member. Well run establishment! This hotel was great. We checked in around 1:00 am. We had an issue with the tv remote not working complete. The woman at the front desk offered to move all of our belongings to another room. We opted to keep the room we were in with the remote that partially worked. Very clean lobby and room and very courteous staff. The staff was very friendly and approachable. I wanted to come earlier and I was able to come in at 2pm instead of 3pm. During checkout I need some extra time and they extended my checkout by a hour no extra charge. So they are great to customers. The room was okay. Two of the towels had spots on them. And decorative linen was a bit dirty (hotels rarely wash the cover sheet on beds). If you get a discount/coupon it is a good deal. King Mini Suite doesn't feel like a suite but it is good for two, and has a pullout mattress in the couch. The bed was good for my partner but too soft for me. Television and wifi were fine. 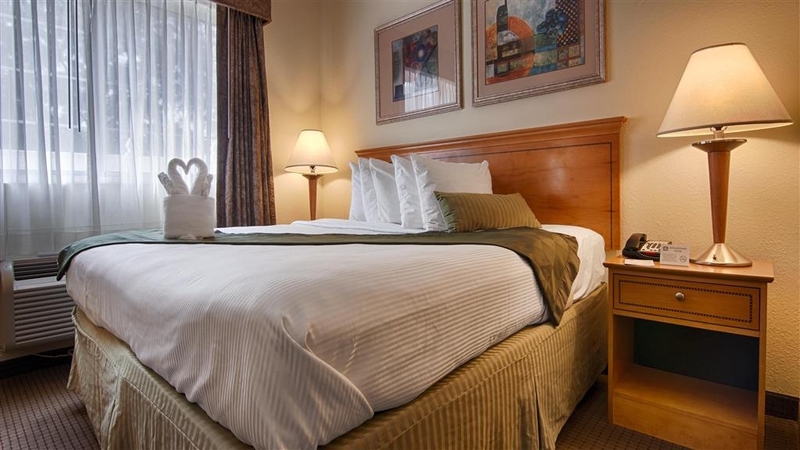 The hotel is easy to navigate and is in a great location in Newport News. "Good Value near plenty of dining / shopping options"
Given the very busy area, they are located back far enough from the main street you can't hear the noise unless you are by the pool. That's not a problem. Some renovations are in progress, but noisy or bothersome. The breakfast area is quite small and congested with only a few people. Awesome stay, room and furniture were very clean and comfortable. We stayed for a weekend getaway to Busch Gardens Williamsburg and Colonial Williamsburg. The drive to these destination were 15 and 30 minutes so it was very manageable with multiple routes you could take. "Good clean PET Friendly Hotel"
We r\\travel with our Catahoula Leaper Dog and he well behaved but needs a place to sleep when we travel. It is hard to find a no\\cie hotel that allows pets and we found one. We travel to the New Port News area 4 times a year and will be going back to this location due to the great rates and clean facility. "Best Western Plus Newport News Inn & Suites, Newport News, VIRGINIA"
Nice appearance on the outside, but inside the hotel a bit run down. Room smelled of smoke. Refrigerator was very noisy. I had to unplug to sleep. The breakfast was OK, but the scrambled eggs were pretty bad. How do you mess-up scrambled eggs. 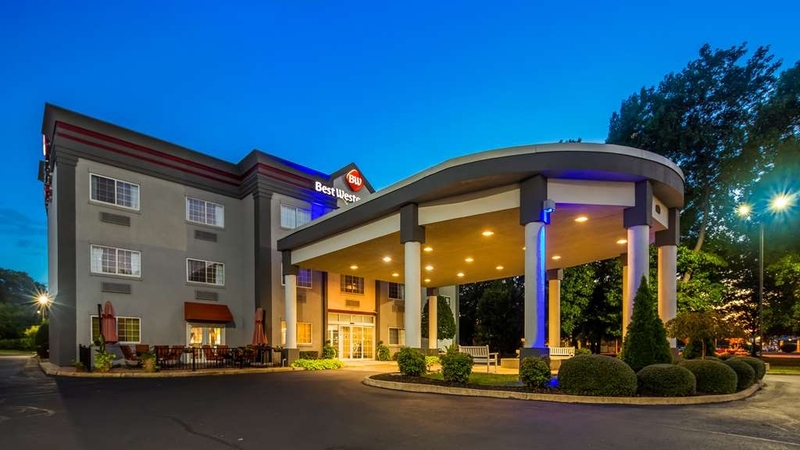 "An excellent hotel worthy to be revisited"
It was my 1st time to stay in Best Western Plus Newport News Inn & Suites, Newport News, VIRGINIA. The room is spacious, clean and well-decorated. The bedding is comfortable and it may need thicker comforter. I slept well in this hotel. Breakfast is amazing with a variety of choices including pancakes, nuts, fresh fruits, hot items, etc. The lady serving the breakfast provided warm-hearted service to my son. I deeply appreciated her. It would be better if the hot eggs have less salt. The internet connection is slow but still acceptable. The hotel staff was very helpful and considerate to give me a late check-out. Overall, I strongly recommend this hotel for vacation in Williamsburg and Newport News area. "Great value, awesome wifi; will consider staying again"
We wanted a place between Va Beach and Williamsburg; we "require" breakfast included wifi, and a pool. We enjoyed the pool Friday evening until Hermine got close enough to begin raining on us, and we enjoyed the hot tub as well. I liked the fact that there was an outdoor restroom right there, and pool towels were available, although they were small and thin, it still beat dragging out our beach towels or using the bath towels. The breakfast was the same each day- hot scrambled eggs, sausage, sausage gravy, cereals, pastries, fruit, and yogurt and egg salad sandwiches in a cooler, plus milk, coffee, juice (yay, even cranberry). The room was really clean, even though the sofa springs were pretty worn, everything else was great. The room we had was a 2 double bed suite, so plenty of room for 4 adults to spread out and have space to themselves.We needed "economy" this year, and this was better than the previous "economies" we've ever used. "Glad we only spent 6 hours here..."
This was the second time I stayed here. The room was spacious and clean. The breakfast was pretty good with the typical selection of hot foods, scrambled eggs, sausage patties, biscuits & gravy, a variety of breads & cereals. I arrived right after the breakfast opened and the gravy wasn't as warm as I like. However I was able to microwave it. The WiFi worked ok for me on my smartphone. One caveat, they have a mild air freshener that fills the hall ways with a nice smell. If you're allergic or sensitive to them, I don't recommend staying here. "A Poor Experience for a Best Western"
At check-in and check-out, the staff was not warm or welcoming. In fact, they were quite unfriendly. Never welcomed us at check-in, didn't provide us with the Diamond level welcome amenity and didn't even made eye contact. Our room smelled of wet/sour carpet, similar to cat pee. House keeping did a good job and ensured our room was serviced each day and ensured we had plenty of fresh towels. The furniture in the room was doom roomesque and the sofa and chair had seen its best days at least five years earlier. At our early a.m. check out, a woman, presumably a hotel employee yelled from across the lobby, "Just leave your keys on the desk. Have a good trip". No, "How was your stay" or anything close to that. She never even looked up from what she was doing. Room was nice but the tub/ shower area was old/ dirty and the wi fi was completely useless for my wife and I. If you could get on the network you would be disconnected shortly afterwards. I would not recommend this place considering other choices in the area. We stayed two nights this past weekend for a wedding in town. We had several rooms for all the family that stayed from out of town. This hotel was below the standard BW, not sure why it's even a Plus. The pool was too nasty to get in and swim. The rooms needed a lot of attention. The lobby and dining areas were very small to accommodate our family and other guest. "Good with the exception of the WiFi"
Comfy rooms, good parking and location. The WiFi was the letdown, pretty much unusable. Otherwise a great place to stay. It should be noted that all rooms have ethernet connections to he internet, this doesn't help tablet and smartphone users. I stayed at this hotel during my daughter's college move. It was overall very good. It is pet friendly and I can say that my experience/accommodations with my dog were a very good value for the money. Staff was polite and attentive. The property was clean and well kept. We stayed at this hotel during a visit to CNU. It was one of the few that allowed pets. Our room was non-smoking but smelled heavily of smoke. The hair dryer didn't work, the sheer curtain was torn and the pull out sofa mattress and springs were really worn. Breakfast was ok. Pool looked nice. It was a really nice hotel I stayed for 4 days with me and my bf for our vacation. The breakfast was wonderful costumer service was good and housekeeping made sure our room was clean everyday even folded my bf pants and placed his shoes nicely under the table I will stay again! "Never Again will this hotel be an option"
It has too many negative points to name. 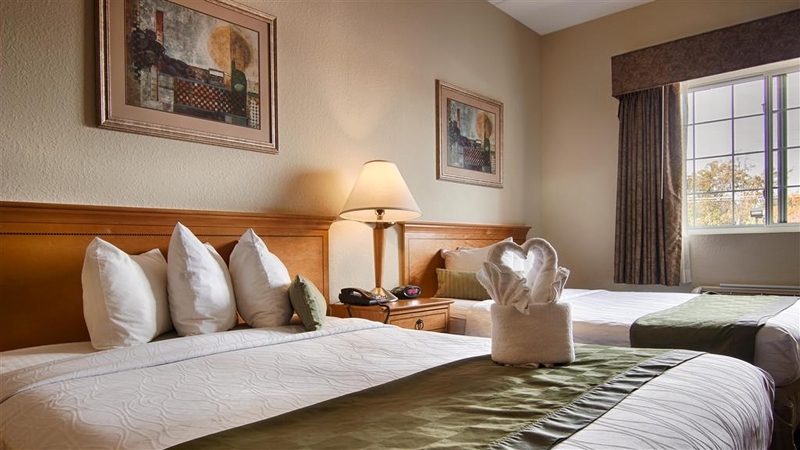 My children and I wanted to be close to family and close to Busch Gardens this hotel was ideal, however the rooms and the atmosphere were not very accommodating. From free internet service that was the weakest connection from the first floor I have ever experienced to a 3 hour power outage that no one could do anything about including making us feel comfortable, it was a terrible experience. We arrived late in the evening and stayed in a room with 2 double beds and a sofa bed. Pulled out the sofa bed to find personal items folded up with the mattress and sheets that were quite obviously dirty. There was no housekeeping available and the night manager only offered us clean sheets to replace the soiled ones ourselves. Bathtub did not have a plug. Supplied breakfast was good and the staff in the servery were excellent. Not very impressed with our stay here overall. Just believe me it is one of the best hotel in newport news, if you are not looking for marriot or radisson for the price you pay is great. Breakfast is a good, pool is nice and rooms are large for family of 5. When ever i come to Williamsburg area i will stay here. "GREAT STAY & AWESOME PRICE!" I will return soon! My family had a wonderful time at this hotel. Everyone was great! Our rooms were cleaned and breakfast was Awesome! I like the new Patio off from the breakfast area this was a plus for me. Thanks making our stay very enjoyable! We will return soon! Recently stayed here for a wedding. I originally booked a suite with 2 Queen beds and a pullout couch, was given 2 double with pullout but still was a decent size. The breakfast was ok. Pool was clean but they need more chairs and lounge chairs. We have stayed in this hotel previously and booked it again based on our previous positive experience. The hotel was a great value for the price a couple of years ago. Seems as if there are a few updates needed now. Upon arrival I noticed an odd smell In the hallway of our floor. Our shower had a clump of hair in it, which we asked to be cleaned. The shower curtain had visible mold at the bottom of it and there was mold in the shower also. The pool area was pretty dirty; bottles and food wrappers were visible on the ground.the walls of the pool were so dirty that previous guests had scraped their names into the slime. The size of the room is great, especially if you are traveling with a family. However, the beds are very hard. The breakfast selection was great and the staff maintaining the area was very friendly. The front desk staff was great! They were very friendly at check in and check out. Overall a good value, average hotel with good customer service. I stayed here for one night. It's not a very big hotel but the rooms were a nice size. We rented three rooms and each had a let out couch plus the 2 double beds. Each room slept 6 ppl comfortably. It does have an outdoor pool that wasn't too deep but a nice size. I'm not very pick but I did have two things I didn't like about this stay. There were ants in the room even though we didn't bring any food in the room and the continental breakfast food smelled bad. The biscuits were hard and the gravy smelled bad. Since I was only there for night sleep this hotel was still decent. I would stay again. Had to make unexpected trip to the area for a funeral. Tried to find a hotel that was clean and would not break the bank. Upon reading the reviews we decided to stay here. Check in was efficient and friendly and then it started. Upon entering our room there was a smell that is hard to describe.Kind of like it was a smoking room that was being covered up with a perfume deodorizer. Needless to say it was very unpleasant especially after being out of the room and coming into it each time. We noticed the air conditioning unit was loud. VERY LOUD! Thinking it was on full blast we went over to adjust it only to find out it was just on low. (It was the old kind that you still adjust on the unit, not with a wall thermostat). Each time we made a phone call or face timed home we had to turn the A/C off to hear. After accepting this we turned on the TV only to have no signal. After a few attempts to figure it out ourselves we called down to the front desk. The friendly front desk clerk came up herself and low and behold was able to get it fixed. The next day after leaving early and being out of our room until around 3pm we returned from an emotional day only to find out housekeeping had not been to our room yet. We found them in the hall and just requested clean towels to take back to our room. The breakfast was standard fare for a hotel. But the eggs were cold and the sausage was just not good as in could not eat it. The eating area was small but clean. Overall the hotel was clean and I understand the hotel has high reviews as to why we picked it. Hoping our room was a fluke and on the list for updates. "Overnight stay on our way to OBX"
We stayed in this hotel two years in a row on our way to OBX. Last year, we were impressed. This year, not so much. The hotel isn't as clean and has become pretty beat up. Not sure what happened in the last year! It's a shame because the rooms are a great size, the price is right and you really can't beat the location. Hopefully , things will turn around for this once awesome hotel! "Very great for families traveling with pets"
My family needed three rooms for our annual trip to the Outer Banks. this can get very pricey, as we, the parents like to pay for everyone's room. We have a small dog, and both of my children each have small dogs. Your very reasonable room rates, plus the very reasonable rate for having a pet in our room made me very happy. Everyone agreed this was the best hotel we have found to help break up our very long trek to OBX. "Great room, great staff, and great stay"
We stYed in a large 2 room suite. This is the largest suite I have stayed in. So roomy and plenty of privacy. The pool was clean. The rooms were clean. The whole hotel was clean. The staff was always very nice. Breakfast was simple but plentiful. If you gomlate, they will be out of a lot of things. They were sold out the week we went. Very close to the airport and all atteactions and reasonably prices. Overall great. We would definately stay again. 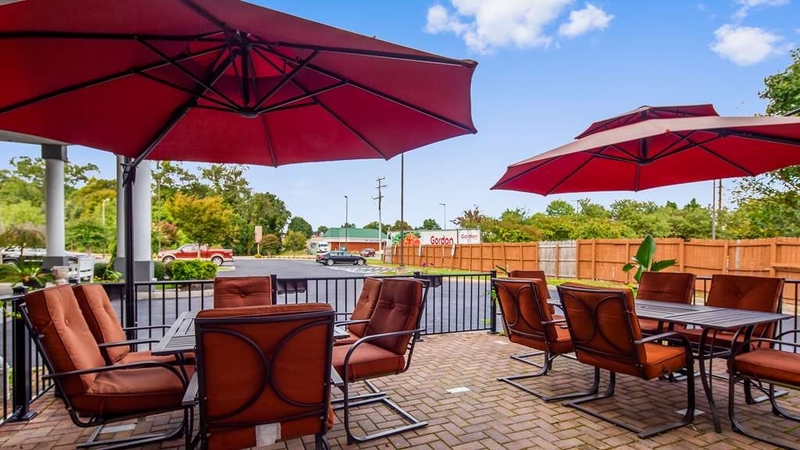 "best western plus, newport news"
this hotel is located close to the airport, and within easy drive to attractions from Williamsburg to Norfolk. we spent three nights there, enjoyed the pool, and hot tub, after sight seeing all day. we would come back to this hotel anytime we visit the area. We have stayed at here on many occasions on our annual trip over to the States and yet again we were not disappointed. This hotel has improved greatly since we first stayed 16 years ago. The room was spacious, imaculately clean and the beds comfortable. The breakfast had a good choice of food and the pool area had comfortable beds. This hotel was absolutely awesome! Appears to be newly remodeled, the staff is terrific and the hotel was very clean. Check in was quick as was checkout. The staff was great and acted as if they enjoyed their jobs which is rare in the hospitality world! "Great value, close to CNU"
Great value: Good quality, nothing too fancy but clean and friendly and comfortable. Perfect for a night or two if you have a student at nearby Christopher Newport University. I was attending CNU orientation with my son as a freshman, so going forward I'll be staying here many times over the next 4 years. "Great staff, sub par room"
My husband and I stayed here for the 4th of July weekend. When we arrived, the parking situations was insane. The parking lot here is just set up weird. Our doubt were short lived when we checked in though. We were greeted by such a sweetheart of a lady. She was patient and kind- giving us all the time in the world for questions and information about local spots to see. Another of the staff members was also very kind the next morning at breakfast; which I might add was not that great compared to other hotel breakfasts. The room was huge! My perfectionist tendencies pointed out a few things that were a little unclean in my book (miscellaneous splatters on the wall?) Wi-Fi connection. Was not that strong here though. All in all the hotel was a good choice for us- not too expensive, in a good location, and comfortable for a nights rest. There was nothing about this hotel that made it stand out as a place I would stay again. Exterior was boring and lacked any décor that would draw attraction. Bathroom was very small, a/c was not working at check-in, and the floor was uneven in many places. With the floor, I got the impression our room had maybe been remodeled at some point (long, long ago) and the floor was not leveled out, leaving spots that are lower than others. Not what I would consider a good job. Bed was comfortable. Breakfast was ok, but nothing spectacular. One two occasions during our 2 day stay I saw a suspicious looking vehicle with blacked out windows (illegal in this state) driving back and forth through the parking lot. There is nothing awful about this motel but we will probably will not stay here again. Good location for visit to CNU. Dog friendly with a nice grassy, level area not far from front door to walk pet. Also reasonable walk to shopping and restaurants. Hotel clean and comfortable.Would suggest room on West side away from Jefferson Ave traffic noise and early morning sun. Hotel had a decent breakfast and a man who seemingly liked his job and was dedicated to keeping the breakfast and lobby area very clean. The room was OK.. Bed was uncomfortable and bowed in the middle. The housekeeper didn't do a very thorough job of cleaning it before our stay. 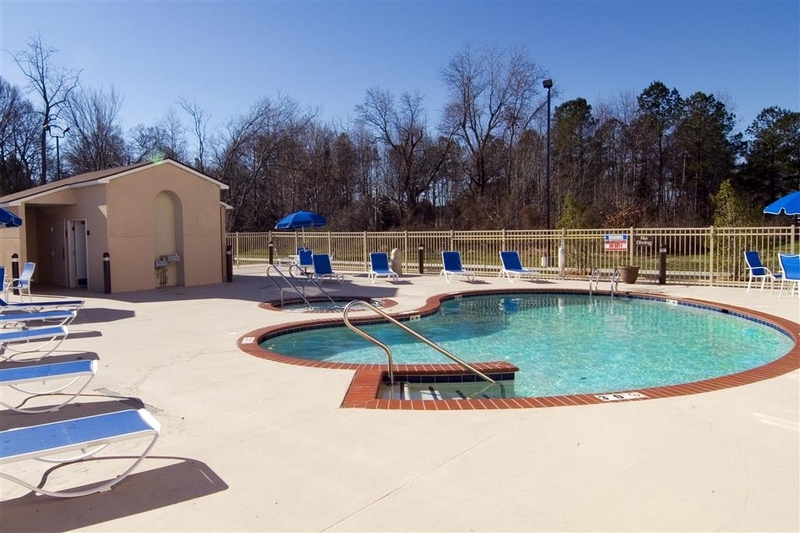 The pool area is great and was well maintained, the area was very convenient. "Major Security Warning for an average hotel"
Before I give the standard review, I offer a major warning about this hotel. Do not book over the phone unless you want your credit card information compromised. As we were waiting to check in the woman at the desk was taking a reservation over the phone and she repeated the person's name, full credit card number and expiration date loud enough for all in the lobby to hear. She should have gone back into the office for that type of transaction. As for the hotel, not sure what makes it a Best Western Plus. It is a rather ordinary hotel with little to recommend it from any other roadside hotel. On the plus side it is convenient to the interstate, airport and numerous restaurants. The negatives are that it is a little worn and the free wi-fi becomes agonizingly slow at night when many folks jump on to use it. I can't say I would never stay here again but given the opportunity I would look elsewhere and this is a competitive environment for hotels. I experienced a Good stay during the weekend. I would rate the hotel overall as very good. I had no displeasure with any of the services. I would offer that when trying to print a document (Excel spreadsheet) , I was not able to do this as the business Center's computers were not able to accommodate this type of file. This was our 2nd time staying at the BW and unfortunately it will be our last. It seems as though since last summer it went downhill. We got in earlier than expected on Memorial weekend and decided to see if we could check in after a long ride. The front desk said there were no rooms ready at the moment, so since the weather was beautiful, we asked if we could sit by the pool till check in & she told us that the pool wasn't ready to open as of yet. She said it may open Sunday (which was calling for rain) or Monday (also called for rain & we were leaving back home) I'm sure every hotel knows that they need to have their pools up & running especially for Memorial day Weekend when the hotels are fully booked with familes. This was one of the main reasons why we booked this hotel because of the pool last year we were there Memorial weekend and pool was up and running what happened this year? The kids were so sad that it was almost 90 degrees and sunny & no access to pool, and we weren't even given a heads up before checking in about the pool being out of service. We looked out the window at the pool area every day and it was nowhere near being ready, it wasn't even being cleaned so she actually lied to us. (Look at the picture dirty pool nowhere near being ready to open) Never once did we see a maintenance person by the pool let alone in the hotel so I think this is why this hotel is going downhill. During our stay, our room was never cleaned, that explains the stained bed runners and dusty room. We ran out of fresh towels, so we called the front desk for towels & gave them our room # and they didn't come up so we left for dinner, when we came back there were no towels in our room, we called front desk and they said the towels were at front desk to come & get them.. really? how is that room service for you? The breakfast was horrible we got on the long line, in a tight crammed space to see that they were out of the watery powdered eggs & the stale muffins & bread, the coffee taste like hot water, so upset & hungry we got off the line and drove down the road to Dunkin Donuts. We weren't the only ones at this hotel with issues, there was a line of people complaining about their stay I had to get back on the road before I hit any traffic, so I didn't stay on that long line of unhappy customers. This hotel is in need of a maintenance person and a crew of cleaning personnel. We visit Virginia often in the summer and this will be our last time at this hotel I will look elsewhere for a more pleasant stay. Hotel was very clean and has had many improvements since our last stay to the exterior and sitting areas. Staff was very friendly and pleasant. Pool and hot tub were not open though, big downfall to me as this was the reason we like this hotel. "Nice hotel with poor housekeeping "
Great location with large spacious rooms. Friendly staff at the front desk makes you feel welcome. Beds are comfortable however the room I had was littered with trash in the corners and a disgusting black mold in the bath area. Didn't notice the mold till I pulled the bath curtain back. Grotesque! What could be a five star spot drops way down, such a shame. We chose this location because it was centrally located to many attractions. In fact it is within 20 miles of 14 attractions, major military and corporate installations or headquarters. So Yorktown, Williamsburg, Jamestown, Fort Monroe, Marine Museum, and others are within a few minutes reach using the nearby freeway. The room was clean, and well supplied, free WIFI is available, and the breakfast was quite good. A wonderful way to start the day's adventures. the front person was pleasant until i asked if i can move to another room. heavy smell of cigarette smoke and i was told the room i'm requesting was reserved. i was like 'reserved"? but not booked. reserving for whom?!?!?!? it makes me think that because of the rate i'm paying, i get the worse room in the hotel. her being pleasant turned to bleh. i seriously sucked it up the smell of the room and no chance i'll be coming back or recommend this hotel. The first time we stayed here there was a few minor problems but this time everything was really good. The breakfast was very good and had a variety. One day we were able to sit outside so that made it really nice. Front desk was very polite and helpful and the housekeeping were really nice. "Retirement Celebration for Dr Marcellus Harris, Or." It was a great trip and a great stay at the hotel. My family enjoyed themselves. We had four rooms.I guess the only complaint I had was a night clerk who would not let us take one pear to our room. She kind of reprimanded me in a way. Cindy(sp) was real sweet and pleasant. We select Best Western for reliable quality and value, not expecting anything to write home about, but usually a product we can rely on. For the most part this hotel met their standards. The bed mattress was harder than I prefer, but I know that is a subjective observation. Everything else about our one-night stay was fine. The staff was very welcoming and hospitable, and the room was cozy i will most definitely be staying here again. The hotel was quiet with a relaxing environment and the location was within walking distance of several restaurants and businesses. Thanks so much for taking the time out of your day to let our TripAdvisor family know how we've treated you. Your feedback is very valuable to us and we really appreciate it. A wonderfully hospitable staff that was always happy and thankful to serve us. Cyndi was an A level service agent at the front desk whose mission felt like always making us smile. Truly looking forward to the next time I am in town. Thank you for choosing the Best Western Plus Newport News. We look forward to your return to experience our friendly staff again! So glad to find this hotel. Experience was so much better than expected. Breakfast bar was decent. Coffee was good. We will definitely staff again the next time we visit Newport News. Room was very comfortable and a welcome relief giving a good night stay after a questionable pick the first night of our trip. Dear Michael, Thank you for your recent review. We appreciate you taking the time to let us know how about your experience in our home. We look forward to seeing you when your travels return you to Newport News. "Best stay of the trip"
Thank you for your recent review. We appreciate you taking the time to let us know how about your experience in our home. We look forward to seeing you when your travels return you to Newport News. The staff was very kind and helpful to our whole party. The kids enjoyed the stay and liked the breakfast. We only stayed one night but, it was arranged a month in advance for our elementary school competition. Wasena Elementary, Roanoke, VA. The big surprise was the huge rooms -- in the double room we stayed in, there was a huge sitting area/living room. While clearly an older hotel, the room was very clean. The location was also bet convenient to restaurants and stores. "Fine for an overnight stay"
The motel is old and needs updating. the bed was very comfortable .The staff is very friendly and helpful. Was very impressed by the breakfast which even had prepared different kind of sandwiches which you could take and eat later in the day. If the opportuniy would arise I would stay here again. "It's what you'd expect for $75 a night." The staff at the front desk were very friendly. The room overall was not impressive, it was clean but a lot of the furniture was very visibly damaged or broken. The walls are very thin, we could hear every noise from our neighbors room, when they used the bathroom, etc... My wife and I were given a handicap accessible room and shower, but the shower water flowed out into the bathroom floor soaking everything. The location is great, as it's right off of a main road where there is a good deal of shopping and restaurants. One of the best hotels in the area. Rooms are clean, don't smell (like some others in the area), and the staff is always friendly and nice. They have given me suggestions on dinners, driving directions to avoid traffic, and just plain old talking. It is nice when I am away from home to have people who actually care. Stayed at this hotel using a Groupon so, the price was right. No issue upon check in with the reservation done through Groupon Getaways which was a huge relief. A seemingly older hotel but clean, well kept, and nicely appointed. The front desk clerk was friendly and helpful. The free breakfast, as plentiful as it was, was just OK. The coffee was not good so, that was disappointing. The hotel is conveniently located of off I_64 and Is close to lots of shops and restaurants. I would consider staying again if I could get a room at the right price, using a Groupon or otherwise. 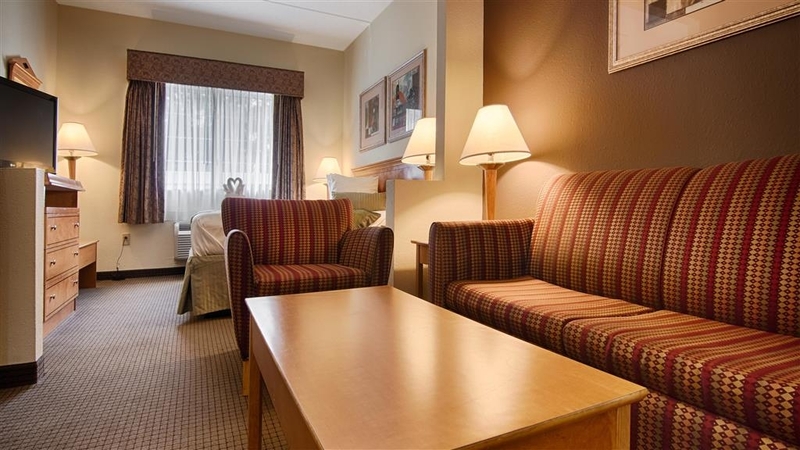 This hotel is clean and nicely appointed, staff is efficient and friendly. It is close to many restaurants and easy to find. Nice to have a refrigerator in the room. The BW breakfast is if nothing else consistent, although there are not enough seats in the room. All in all the place is good, I would go back. "Pretty ok for the price"
Room was clean, showed some signs of wear (curtains, back of door. etc) but my room on the 3rd floor was quiet and offered ample space for my husband and our 3 kids in tow. Via groupon I only paid a little under $70 for one night--not bad. My girlfriend and I had a wonderful time together. The bed was nice and soft. The service was nice. Breakfast was okay. I would recommend this hotel to other couples. The only downside was that the room smelled. Best Western has very good rates, but better if you order online. The staff is very professional and helpful. The rooms are very comfy (just request not to stay in the room next to or below the gym...very noisy, very early). The location is really great, walking distance to the mall and all the great restaurants. Also, it is only a 30 minute drive to the beach and Busch Gardens. My husband and I came to VA to look at a potential move. We picked this hotel through Groupon and the rate was great! The hotel in itself was amazing, the staff was great, the hotel was clean and smelled so good. Our room was impeccable and we stayed in a double bed and my husband and I slept very comfortable, no weird critters either, I always check for bed bugs! the room was also very spacious. This hotel was close to EVERYTHING; all shops and restaurants. We loved it and would stay here again. Dear Guest, Thank you so much for your review of our hotel. I am pleased to hear you enjoyed your stay with us. It's something our staff take great pride in, as you can see by the service you received from Jerry, Reene, Aremda, Norma and all our other great staff members. We hope you will visit us again soon. Another excellent visit to this hotel. Front desk staff are always very friendly. Room was clean and comfortable. 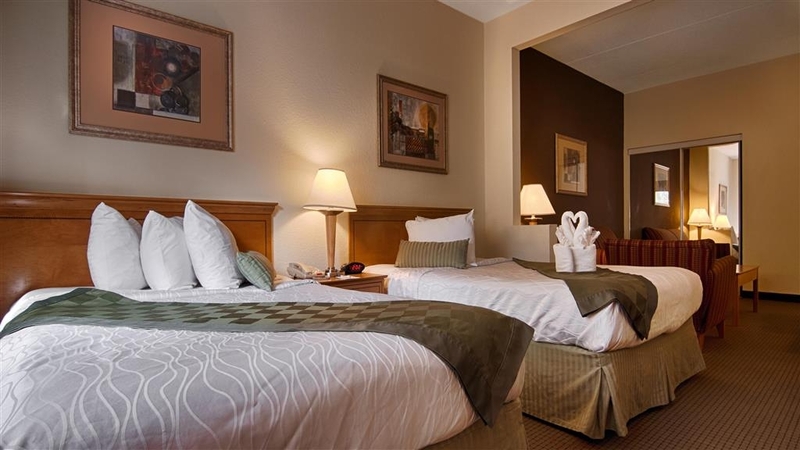 Hotel is conveniently located to many restaurants and shops and interstate. I stay here every time I am visiting the area. Dear Guest, We certainly look forward to your return visit with us. We are pleased to hear everything was to your satisfaction. Thank you for taking the time to write a review. Experienced problems regulating temperature in room. Breakfast same every morning and sometimes short of some foods. Internet slow and Wi-Fi weak. I thought price a little high for what we received. The front desk personnel were very friendly and helpful when we checked in and out. Dear Guest, Thank you for your feedback. We take our guest comments very seriously and always strive to provide comfortable and friendly accommodations. We appreciate your nice comment about the front desk staff. However, we're sorry we fell below your expectation regarding the breakfast selection which was unacceptable. We will address this concern. We take all reviews positive and negative very seriously, and your feedback will help us improve for our next guest or your next visit. As a premier rewards member, this was the first time I was charged extra for early check in. When we arrived to check in, the front desk clerk ignored us for 2-3 minutes while she finished her personal phone call trying to resolve a charge on her personal credit card. Then the coffee maker didn't work. I may have been able to overlook a single issue, but when all this happens on an overnight stay, it sends a pretty clear message about not putting customers first. Thank you for your feedback. We take our guest comments very seriously and always strive to provide comfortable and friendly accommodations. However, we're sorry for not acknowledging you right away by the front desk clerk. We will address this concern. We take all reviews positive and negative very seriously, and your feedback will help us improve for our next guest or your next visit. Dear Guest, Thank you so much for your review of our hotel. I am pleased to hear you enjoyed your stay with us. It's something our staff takes great pride in, so we value your feedback. We look forward to when you visit us again. "Convenient location off of highways"
"Well located to highways and restaurants"
The staff was courteous and helpful. The room was clean, well decorated and comfortable. The bed provided a good night's sleep. The breakfast was well prepared and tasty. Internet was free and fast. I will definitely stop here again when in the area. Room was nice and spacious. We had two double beds and a living area. Much cleaner then I expected. Staff was friendly. Free breakfast was nothing special, I've had better at Ramada Inn. Overall, I was happy with how clean the room was. I would Def stay again. One comment, GREAT! My stay at the Best Western PLUS in Newport News, Virginia was much enjoyed. I was treated like a guest and not a person just looking for a place to stay a couple of nights while attending a concert. The site was in close proximity to where the concert was and close to every sort of eating establishment in the world. I much enjoyed the staff and the five days that I spent there. I highly recommend this site for future visits. Enough said! Excellent in every way. Will definitely be back in the very near future. Wouldn't even think about booking anywhere else. 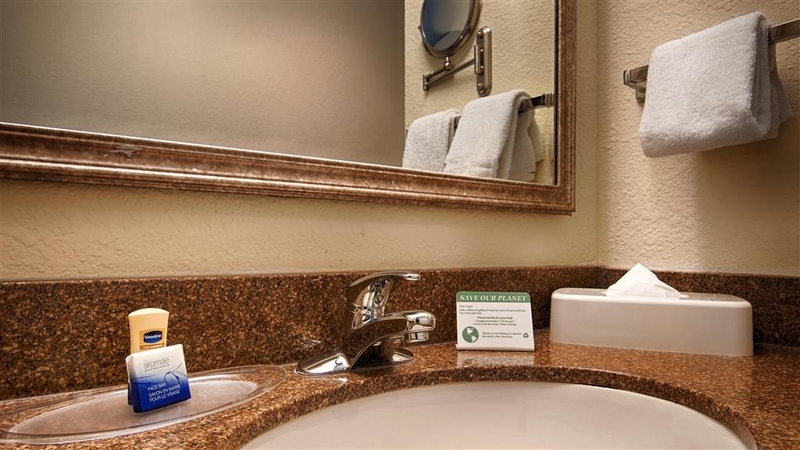 Everything we need and desire is at this Best Western. You won't be disappointed. This was our second time at this location, and even though it's a little out of our way coming to Old Dominion University, we choose to stay here. The people are nice and courteous, the breakfast food is well cooked, very tasty (especially the pancakes) and a clean comfortable area, The beds are just as comfortable as ours at home. And you simply can't beat the location with the mall, other stores and almost every restaurant you can name in a short distant. Amazing. We had a great visit. I would say the only nice best western I have stayed in. The room was clean and the staff was helpful and very nice. Continal breakfast in the morning. Reasonable rates. We had no problem here at all. Will stay here again. For a non-smoking hotel the rooms smelled very stale and reeked of cigarette smoke. We even switched rooms and the new one smelled just as bad! Carpets need updating as well. Wouldn't stay here again and definitely didn't feel like it was worth the $81/night! Stayed numerous times here will visiting Busch Gardens. While its not the closest hotel to the park, its an easy trip - I believe about 12 miles (takes only 15 minutes or so). What I like about this location is that there are many food opportunities very close by - more than those found at hotels closer to the park. "I loved the space in the suite"
The rooms were clean and quiet. The only problem was one of the rooms on the second floor had a smell to it and the laundry room was very small. The breakfast bar was ok, but I had to ask for bread. I feel it should have been filled rather than the employee watching television from the door. ""The staff made my stay super enjoyable""
I stayed in Newport News, Virginia, to visit the Mariner's Museum, something I've always wanted to do. I got a very good deal on the Best Western Plus via Hotels.com. From the moment I pulled into the parking lot I was impressed. The outside of the hotel was very nice and well kept, with a nice fountain and flowers. The shining star during my stay here was the lobby clerk, Mary Ann, who went way and beyond to make sure that my every need was met. My room was very nice, spacious, and the king-size bed was VERY comfortable, I slept like a rock! 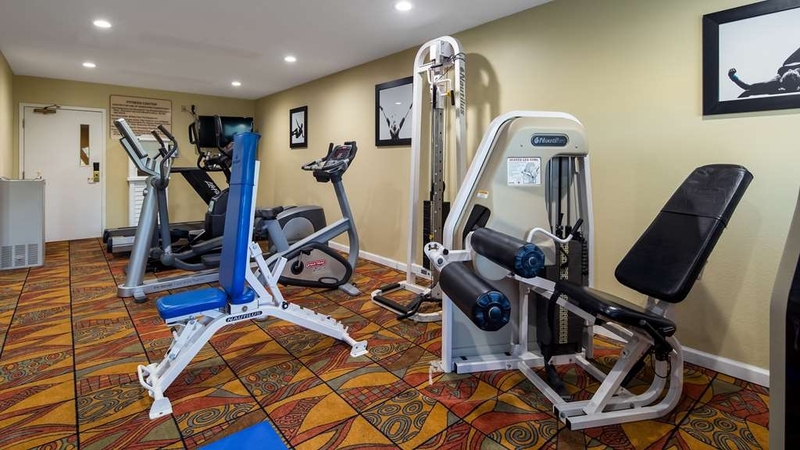 I sampled the exercise room before I turned in for the night and it was quite adequate, being nicer and with more equipment than a more expensive hotel I stayed at later on during my trip. Their free breakfast was complete and very filling, very tasty, with scrambled eggs, sausage gravy, choice of breads, cereals, fruits, and even a super-easy to use push-button pancake maker. Coffees and juices were also there for the taking. I intend on returning to Newport News soon and will definitely be staying at this same hotel. Thank you, Best Western Plus! My overall stay was great looking forward to returning. The breakfast and the room was good as well internet service work really good don't have any disclaimer.would recommend any one to stay at this location because its was worth it even the price was right. Other than the young lady who checked us in, the staff appeared to be unhappy with being there. The room was nice sized, but the temperature fluctuated drastically and there was a strange odor in the 2nd floor hallway. The staff was great. I will be staying here again and again. I liked being hard wired into the internet. The beds were very comfortable. I liked the refrig and microwave in the room. Housekeeping did a perfect job on my room everyday. 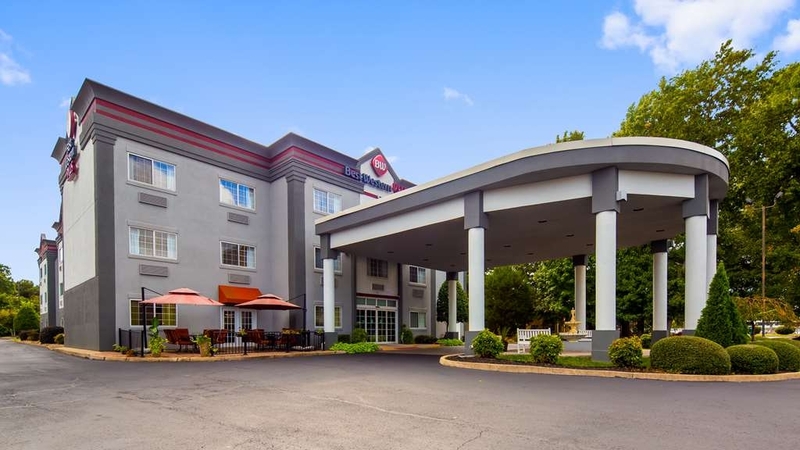 "Newport News-Best Western Plus - Great Value"
"Good hotel for the budget minded"
Great location! The room was large, clean and quiet. The bed was very comfortable with ample bedding and pillows. It was nice to have a couch and comfortable chair as well as a desk chair. The good sized fridge was a plus along with the microwave. What makes this hotel is it's staff. The hairdryer burnt out. Since it was screwed into the wall it was not easily replaced. The front desk staff thought outside the box and allowed me to use an unoccupied room to dry my hair. Breakfast was typical with cereal, juice, biscuits & gravy, eggs & sausage, bagels, etc. What was unusual was the automatic pancake maker. Push the button and out pop 2 pancakes. The breakfast room staff person was exceptional!!! We were walk Ins. We were travelling around Virginia by car and needed a place and thought we'd give it a go. The lady at check in was great we got a King Suite for a very nice price. It was clean very spacious and so comfortable. There was next to no noise from the nearby freeway. Breakfast was a combination of hot and cold stuff and a good selection. There are lots of restaurants and supermarkets nearby. ROOM 305 Stayed for the weekend, as soon as we got on the third floor it reeked of cigarette smoke, it was bad. When we entered the room we were greeted with a musty, mildew smell and it was 77 degrees. Turn the A.C. on high and opened the window to air out the room and there was no screen. Took awhile to get the microwave to work, the hair dryer didn't work. The desk and coffee table were all dinged up. But the bed was comfortable, and the room was spacious. The room obviously had signs of past water damage. One morning, the front desk woke us up at 6:45am with a wake-up call but realized they had the wrong room. Parking lot was small and breakfast was horrible!! Don't eat it! Unless you're having cereal. I wouldn't stay here again. We apologize that your stay was less than desirable, and we'll be taking steps to resolve the issue. We take customer comments seriously and have acted on it and have decided to go completely Non-Smoking from Nov 15,2015. Given the opportunity, we assure you that your next stay will be better experience. Wasn't sure about staying on the first floor a hallway and 2 doors down from the front desk but the the room was clean, big and real quiet. The bed was even comfortable. The Staff was friendly and the breakfast was pretty good, except the plastic covers over the danish and toast were loose so they kept falling off but that's minor. We'll definitely go back. Thank you for your feedback. On behalf of our hotel and staff, thank you for taking the time to leave a positive review. We're especially glad you enjoyed your stay. We strive to provide excellent service, and we hope to see you soon! First of all, I booked this hotel using a service which messed up my reservation. When I got there and found out that the room I booked was not the room I needed, the hotel owner spoke with the booking service and got my reservation cancelled and refunded, even though it was past the cancellation window. He then gave me a great room at an even better price than I would have found elsewhere. The staff here is so accommodating and helpful. The hotel is very clean and the location can't be beat! Thanks for taking the time to share your experience from your previous stay with us! It really means a lot to our team when we receive great feedback like yours. We all share a passion for delivering exceptional guest service to each and every family that walks through our doors. 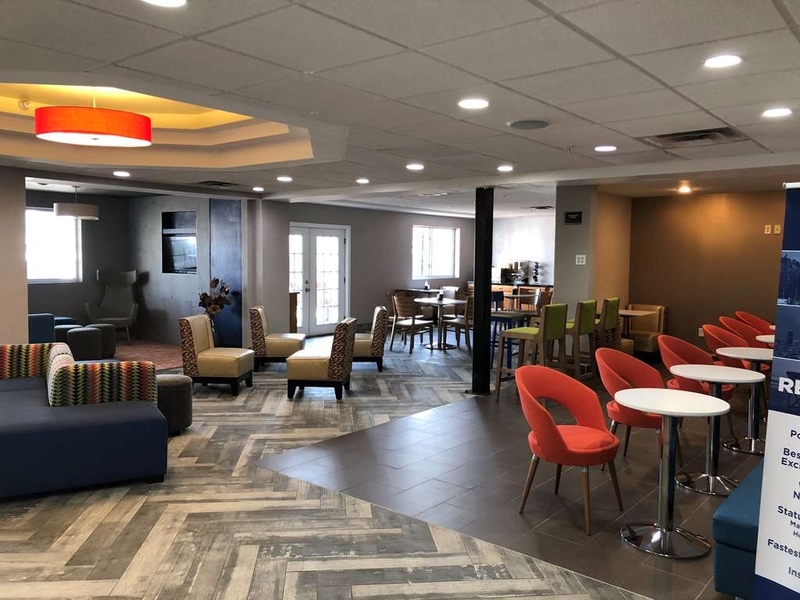 We understand that there are several lodging options to choose from in our area, so the best way to show you how much we appreciate the opportunity to accommodate you is by giving you our very best! This is what every traveler deserves and should expect from our team at BestWestern Newport News. We can't wait to see you again during your next trip! A fantastic value for the price. 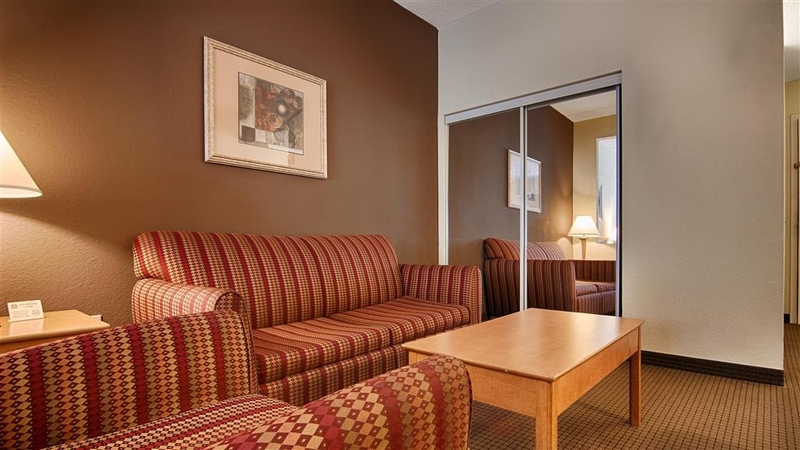 If you are budget minded you cannot go wrong with this Best Western. The facility is old, however it is clean. For the price I paid I was amazed at the size of the room. It had a couch and chair, a microwave and refrigerator. The work out room on the third floor is well appointed with several pieces of equipment, and again, very clean. The breakfast was well cooked. For anyone on a budget a great choice. Thank you for feedback. We appreciate that you chose our hotel stay while in Newport News. Your comments have been noted and will be addressed. We look forward to seeing you when you return to Newport News. Have stayed here several times since opening about 10 years ago. Always amazed at the maintained quality and appearance of the public spaces and rooms over time. Costco rate is an excellent value at this property. "Great comfortable stay for best value!" I've stayed at my fair amount of hotel and let me tell you... This Best Western was an amazing stay! Right when you walk in the lobby area was very clean and the receptionist was very helpful. The King size rooms itself were very spacious, clean, and comfortable. The bed was so comfortable it didn't want to get out of bed, lol. The small details like folding the shower towels into a nice orgamic swan or flower was a nice touch. The hotel was also very affordable! The location was also close to a lot of shopping centers and restaurants and very close to i64. Everyone on the review is pretty much right about the positives of the hotel. The only negatives is the breakfast...It wasn't that tasty, I'd recommend going somewhere to dine for breakfast. Also the WiFi internet would go in and out but I didn't need to use it my whole visit there, the bathroom towels were a bit stale/hard. But overall, highly recommend this place. I will book here again once I'm in the area! "stayed for visit to mariner's museum"
clean, neat, pleasant employees, good value, good breakfast, comfortable bed, easy location to get to.....No complaints whatsoever....If anyone is thinking Williamsburg, Yorktown, see the whole area, this is a nice central location. I travel for a living, and this hotel is among my favorites that I've stayed at. The stay was nothing short of phenomenal: excellent service, fast check-in, very clean, and beautiful interiors. Would definitely stay again! I was a little disappointed with the staff. They weren't very attentive. Most the time no one was at the desk. The room was fine could use a little dusting in the rafters. The bed was very comfortable. The pool was clean and the water was perfect.